C = Gunwale to centerline of cable connection at centered tiller. Most cylinders move with the engine/rudder; enough slack must be left in hoses/tubing to prevent sharp bends (less than 3” radius) and/or kinking. Where rigid tubing is used, flexible hoses must be installed between tubing and cylinder, to allow cylinder articulation. For Most Cylinders, add A, B & C + 24”, round up to next even foot. Order that length hose kit, or twice that length in tubing. 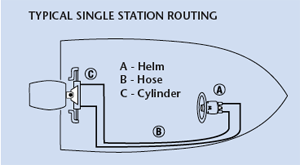 Hose routings (such as those found on pontoon boats) may vary from this drawing. Confirm length by laying a garden hose along cable path and measure run from wheel to engine connection point. A single, front-mount outboard cylinder system is shown in this diagram. If your hydraulic system is different than the one depicted and/or you have any questions about hydraulic steering after reviewing this guide, please contact SeaStar Solutions® Technical Service. Measure existing hose from tip to tip, round up to next even foot. 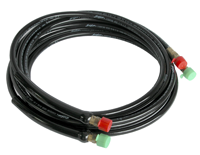 Order that length hose kit, or twice that length in tubing. Can be used with all BayStar helms, with appropriate fittings. 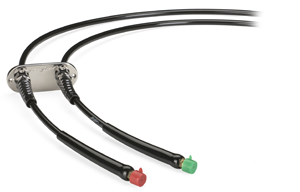 Kit contains two cut lengths of tubing. Includes two hoses – can be used with all SeaStar systems, except SeaStar PRO, BayStar, Capilano and 3-line inboard systems. * SeaStar and SeaStar Pro Hose Kits are available in lengths from 2 foot to 30 foot. 40 foot hose kits are special order only.